Welders: (4) LINCOLN ELECTRIC VANTAGE 300 Stainless Steel Cabinet Welder/Generator, Trailer Mounted, Showing less than 1,000 hours Diesel; (2) LINCOLN VANTAGE 300 Stainless Steel Cabinet Welder/Generators, Trailer Mounted, Diesel; (8) LINCOLN SHIELD ARC SA-250 Welder/Generator, Trailer Mounted, Diesel; (2) LINCOLN SHIELD ARC SAE-350 DC Arc Welder/Generator, Trailer Mounted, Diesel; (3) MULTIQUIP Dual Weld 500 Welder/Generator, Trailer Mounted, Diesel; MULTIQUIP Whisper Weld 300 AMP DC Welder/Generator; Apx. 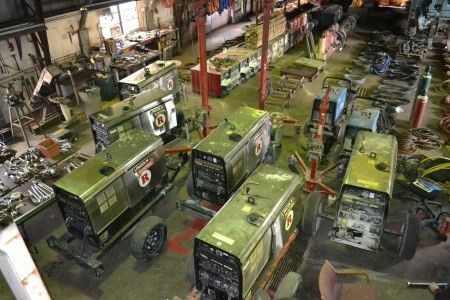 (5) Trailer Mounted Welder/Generators, In need of Repair (Lincoln SA-250’s, SAE 350’s);(2) MILLER/BOBCAT 250 AC/DC Welder-Generator (Propane); (4) LINCOLN IDEAL ARC DC600 Welder 3 Phase; (2) LINCOLN IDEAL ARC R3S-600 DC Welder, 3 Phase; (2) HOBART BROTHERS R-300 Welder, 3 Phase; AIR CO CV-600 Welder, 3 Phase; ERICO Blue Arc ESS-1500, Stud/Stick Welder, 3 Phase; (5) LINCOLN DC 250 MK Hardhat Welders (Dome Top), 3 Phase; (4) LINCOLN LN-8 Squirt Welder Multi-Process Wire Feeder; (2) LINCOLN LN-9 Squirt Precision Control Wire Feed Welder; (6) LINCOLN LN-22 Squirt Wire Feeder Welders; (2) LINCOLN LN-25 Semi-Automatic Wire Feed Welders; (3) 3 Phase Welders In Need of Repair(Lincoln DC-600, R3S 600, Miller SRH-333); Apx (16) LINCOLN LN-25’s & LN-22’s In Need of Repair; (5) LINCOLN DC 250 MK Hardhat Welders In Need of Repair; Apx. (40) Groups of Welding Lead; (2) Groups of Apx. 400 ft. Welding Lead. 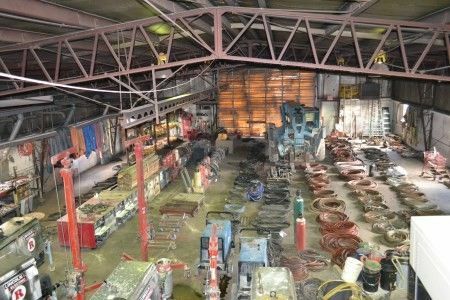 Rod Ovens & Welding Rod: DRY ROD Rod Oven Model 12; (2) KEER K-200 Rod Ovens. Tools: (4) TONE Shear Wench S-110 EZ TC Guns, 115 Volt, 2 recently purchased; (5) TONE Shear Wench S-60 EZA TC Guns, 115 Volt; MULTIQUIP GA-6HA Portable Generator; (3) HUFFMAN WOLFE Roustabout Cable Hoist on wheels; ALL PRO 50,000-85,000 BTU Space Heater; Napa Battery Charger; DEWALT Hammer Drills; MACHO Hammer Drill; DEWALT Rotary Hammer Drills; Banding Cart; GRIP HOIST; Heavy Extension Cords; Equipment Power Leads; C-Clamps; JOHNSON Shop Band Saw Model B; 8” Bench Grinder with stand; Log Chain, Binders & Boomers; (20) Extension Ladders Big and Small; Extension Ladder Sections; Scaffolding, Walk Planks; Shop Carts, Heavy Duty Wagon; Shop Made Beam Rollers; Hilman 100 Ton Model: 5X-OTFLAT-TOPROLLERS; Rope with Whip Chains. Scrap Steel: Steel Scrap Bin; Steel Scrap Bin full of cable; Steel Scrap Skid full of Cable; Steel Light Poles Apx. 30 ft. tall; Semi-Trailer full of steel cable, skid of scrap steel and more. Personal Property Terms: Cash or check w/photo ID; payment in full at time of sale prior to removal; all sales final; sold in As-Is condition w/all faults. All information provided is to be utilized only as a guide. Buyers are responsible to conduct any inspection, inquiry, investigations and due diligence regarding to property. The agreement of auction is solely between buyer & seller. Stanley & Son, Inc. and its agents are exclusive agents of the seller. Any announcements made only by the auctioneer from the podium during the time of auction will take precedence over any previously printed material and/or any other oral statements made or implied. No liability exists regarding the information contained in any printed matter for its accuracy, errors or omissions. Bidding is open, just call out, raise your hand or watch the ring personnel…they will assist you and try to get answers to any questions you may have prior to bidding. With regard to personal property at an auction: The Auctioneer has arranged the merchandise for the auction and directs that it not be altered, moved or disturbed in any way by any person other than normal inspection at the spot where the merchandise is located. The auction staff will assist anyone who has a question or request about a lot or item. Any instance of theft or vandalism will be prosecuted to the fullest extent of the law. Statute of Limitations: Any action or suit of any kind must be commenced within one year from the date when the cause of action or suit occurred or it will be forever barred. The Right of Action or suit will begin to run on the date of breach, damage or injury is sustained & not when the resulting cost, damage, harm or loss is discovered. This Agreement will be exclusively construed & governed in accordance with the laws of the State of Ohio, without regard to its conflict of Laws Principles. The exclusive jurisdiction & venue for any controversy or claim between the parties shall be the State of Ohio, County of Ross, City of Chillicothe, by binding arbitration.